Thursday’s mission was the tenth launch of GSLV in either its Mk. I and Mk. II variants that premiered in 2001 and was off to a bumpy start, reliability wise. 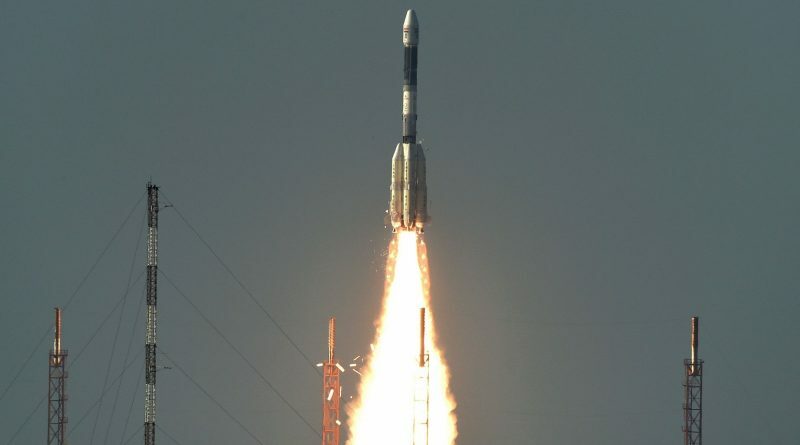 Developed to lift India’s medium-class of Geostationary Satellites, GSLV has a greater lift capacity than the PSLV workhorse which has to drop satellites off short of a nominal Geostationary Transfer Orbit, requiring the spacecraft to spend additional fuel to reach their operational orbits. 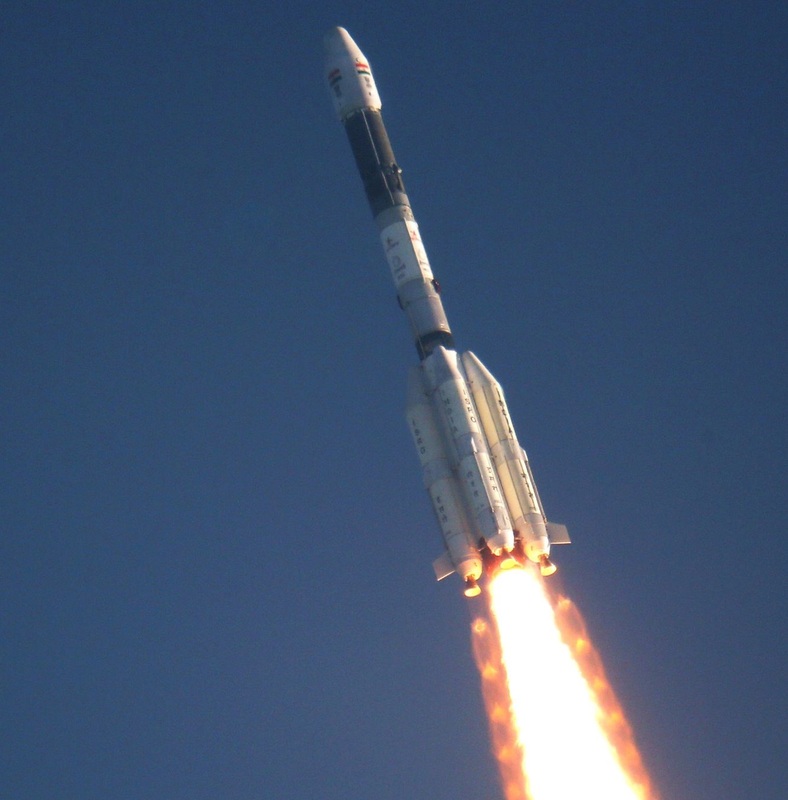 For years, India relied on foreign launch vehicles such as Ariane 5 to lift its heavy Geostationary Satellites and GSLV aimed to end that reliance after a handful demonstration missions. 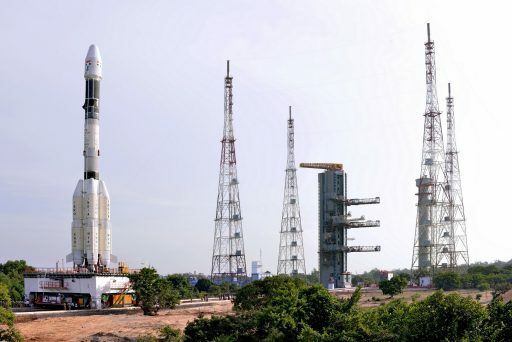 However – after an initial success – GSLV encountered several failures related to various deficiencies on the three-stage vehicle and was sent back to the drawing board in 2010 for a three-year stand-down facilitating a top-to-bottom re-design of the rocket. The re-design improved India’s first cryogenic upper stage and reinforced different structural systems of the rocket with particular focus on the interfaces between the stages and the payload fairing. Since the re-design was completed, GSLV flew to success three times, lofting communications satellites in 2014 and ’15 followed by Thursday’s successful launch of INSAT-3DR. Two GSLV missions are scheduled for 2017 and, pending their successful completion, GSLV Mk.II will be cleared to lift high-profile payloads including India’s Chandrayaan-2 lunar exploration craft. 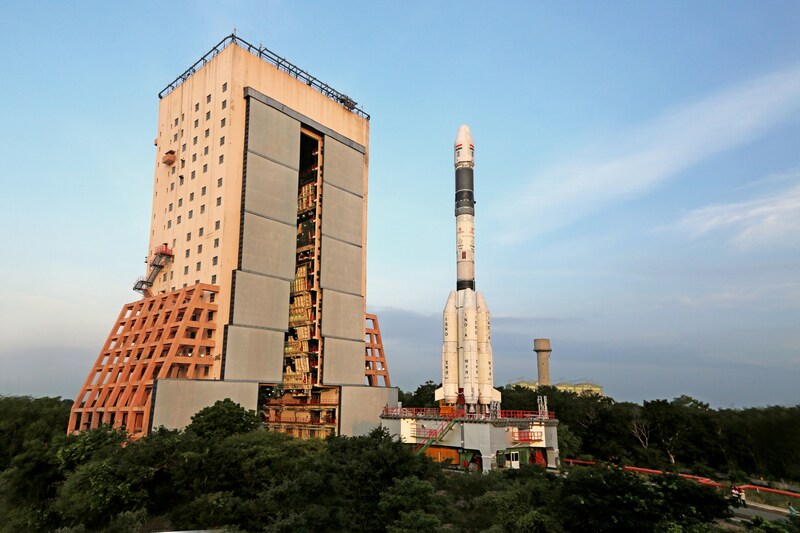 ISRO hopes to launch the Mk.II twice a year and is working on bringing the vehicle to the commercial launch market. Harnessing the power of solid rockets, hypergolic propellants and cryogenic oxygen and hydrogen, GSLV can deliver 2,500 Kilograms into a Geostationary Transfer Orbit, compared to PSLV’s payload capability of 1,425kg to s sub-GTO orbit. The 49-meter tall GSLV rolled to the Second Launch Pad at the Satish Dhawan Space Center last week and entered a 29-hour countdown on Wednesday to get ready for its Thursday afternoon liftoff (Local time). 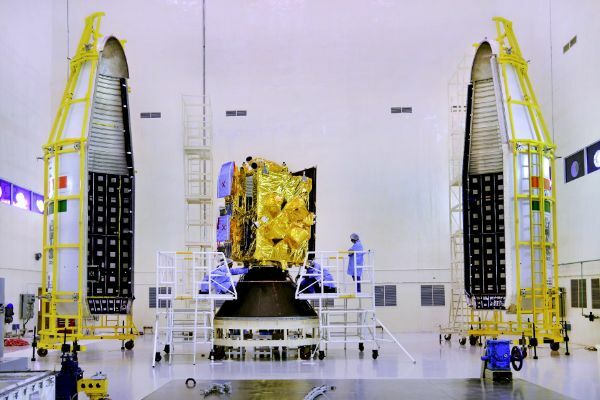 Hidden under the rocket’s 3.4-meter diameter payload fairing was the 2,211-Kilogram INSAT-3DR – India’s next-generation meteorological satellite. The satellite is a slightly modified version of the original INSAT-3D launched atop an Ariane 5 back in 2013 and currently in a partially usable configuration after encountering technical issues early in its planned 7.7-year mission. 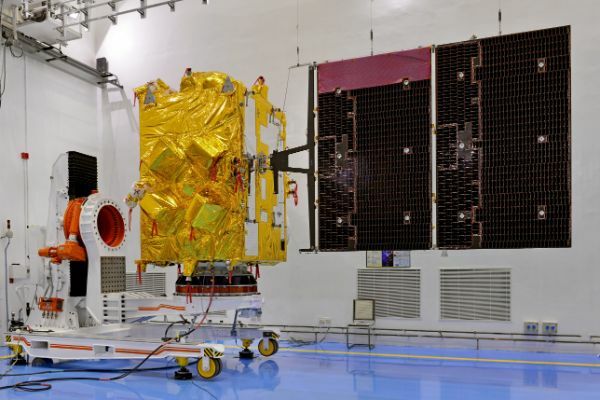 The 3DR spacecraft will join the 3D satellite to expand India’s weather monitoring and forecasting capabilities and ensure continuity of service beyond the 3D satellite’s lifetime. INSAT-3DR hosts a pair of meteorological payloads, an imager and a sounder. The INSAT Imager is a scanning instrument that assembles multi-band images of the entire visible disk of Earth by scanning successive east-west rows. It covers six wavelength bands in the visible and infrared range at a ground resolution of up to one Kilometer to monitor cloud properties as well as surface and ocean conditions with one frame generated every half hour. INSAT’s sounder also employs a scanning instrument with a fast scanning technique to collect vertical profiles of the atmosphere covering 19 channels in the visible and infrared bands to retrieve atmospheric pressure, temperature, humidity and the distribution of different gases. Data from the INSAT weather satellites is shared with NOAA in exchange for U.S. weather data to enhance India’s data products and latency – an important aspect for operational weather forecasting applications. The INSAT-3DR satellite also hosts a Data Collection Platform to receive data from ground-based weather instruments, plus a Search and Rescue payload to relay distress signals from mobile terminals. GSLV employs a wide combination of rocket technology – hosting a large Solid Rocket Motor as its core stage with four hypergolic-fueled boosters clustered around it. 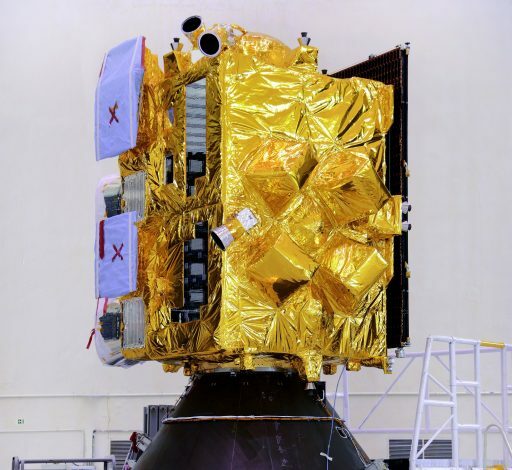 Sitting atop is a hypergolic second stage and India’s first indigenously-developed Cryogenic Upper Stage is in charge of the final injection of the satellite. The first item on the agenda after GSLV headed into its lengthy countdown was filling of the boosters and second stage with hypergolic UH25 Hydrazine and Nitrogen Tetroxide propellants – completed by Wednesday night. With the launch pad cleared, GSLV pressed into cryogenic tanking, a process that continued until liftoff to keep the tanks topped up at flight level. A hold-up in the cryogenic tanking sequence pushed the launch from an initial T-0 target of 10:40 UTC, taking advantage of the long launch window for Geostationary Transfer missions. Over the final hour of the countdown, GSLV received its flight software, went through a last computer-controlled checkout and proceeded into a 12-minute Automated Countdown Sequence to transition to its liftoff configuration. INSAT-3DR was switched to battery power and enabled its launch sequence under the watchful eye of ISRO launch controllers. As the final items before ignition, the 414,000-Kilogram PSLV transitioned to battery power, pressurized its tanks and all control was handed to its onboard computers. GSLV soared to life at T-4.8 seconds when the L40 boosters commanded their Vikas 2 engines to ignite to build up thrust and to be monitored for a brief moment ahead of ignition of the solid-fueled core stage. Upon ignition of the S139 at 11:20:00 UTC, GSLV literally jumped off its launch pad with a thrust of 800 metric ton-force, rising vertically for only a few seconds before swinging downrange. Tracking was confirmed within seconds of liftoff and GSLV screamed away from India’s east coast, pitching and rolling to fly to a due easterly direction to aim for a low-inclination orbit. 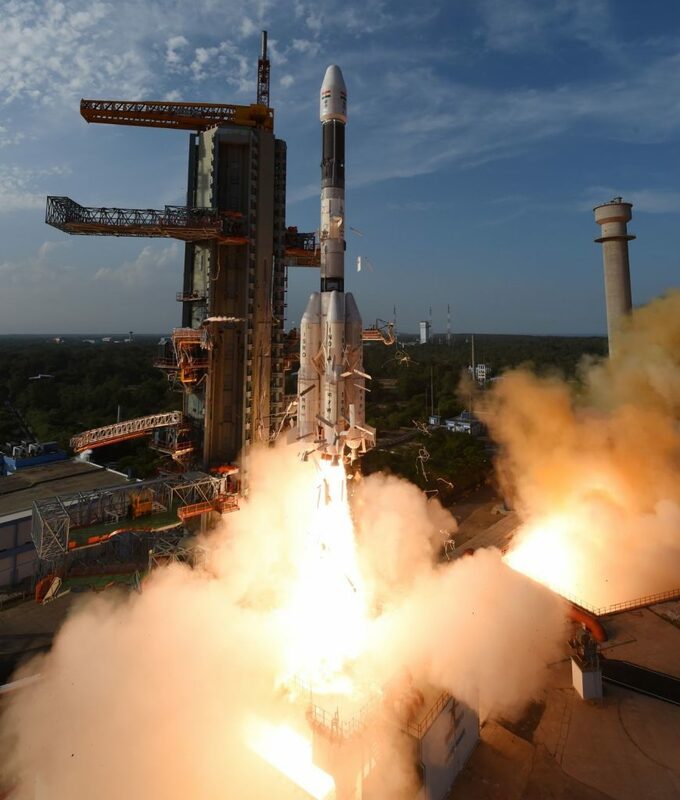 Burning 2,425 Kilograms of propellant per second, GSLV quickly pushed through Mach 1 and encountered Maximum Dynamic Pressure on its way out of the atmosphere. Thrust on the 20.2-meter tall core stage tailed off one minute and 49 seconds into the flight after it consumed 138 metric tons of propellant. The four boosters around the core continued burning, carrying the dead weight of the empty core for another 40 seconds to allow the assembly to separate as a whole. 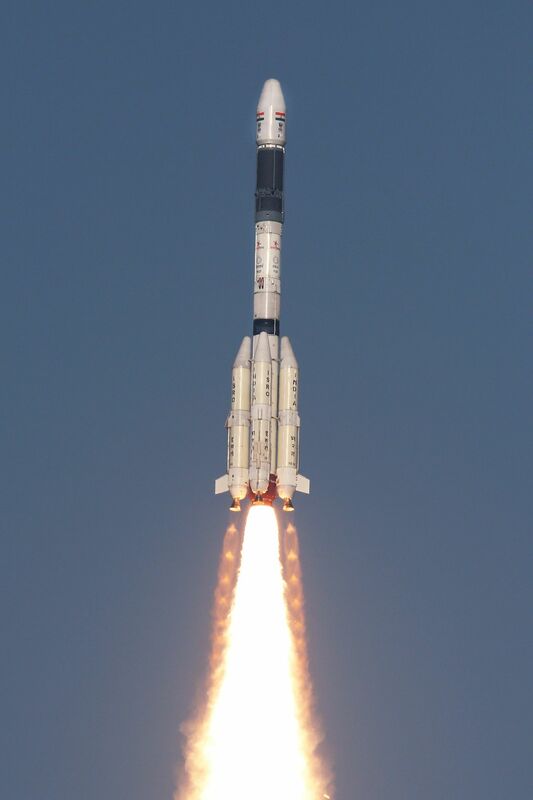 Each of the L40 boosters was carrying 42,000kg of propellants being 2.1 meters in diameter and 19.7 meters long & powered by a single Vikas 2 engine that provided 77,800kgf of thrust. Booster shutdown came at T+2:29 for a hot staging sequence accomplished by igniting the second stage prior to firing the stage separation system to enable the spent first stage to be pushed away by the engine exhaust of the second stage. Following clean staging, 70 Kilometers in altitude, the hypergolic second stage was in charge, firing its 81,500-Kilogram-force Vikas 4 engine to raise the rocket’s speed by 2.5 Kilometers per second. Immediately after staging, GSLV switched to closed loop control after flying a pre-programmed attitude profile during first stage operation. This allowed the second stage to modify its trajectory to fly out any errors and accomplish a high-precision injection. Having departed the dense atmosphere, GSLV dropped its fairing at T+3:49 to shed no-longer-needed weight and reveal INSAT-3DR for the rest of its journey into orbit. The 11.6-meter long second stage exhausted its supply of 39,400 Kilograms of hypergolics four minutes and 49 seconds into the flight, handing over to the Cryogenic Upper Stage for 12 long minutes of tension. The CUS roared to a thrust of 9,500 Kilogram-force delivered by India’s first cryogenic engine designated CE-7.5 which, after the initial portion of its burn, throttled back to 7,500 Kilogram force. 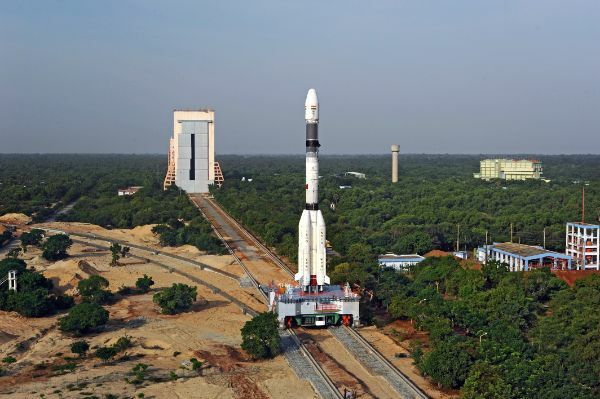 India’s first cryogenic stage is 8.7 meters long and holds 12,800kg of supercold propellants; it is equipped with a single fixed main engine and two 2-Kilonewton vernier engines that were gimbaled for vehicle control. Shutdown of the CUS came at T+17 minutes and 8 seconds when the vehicle sensed it had reached its cutoff target, aiming for an orbit of 170 by 35,975 Kilometers inclined 20.61 degrees. The third stage very quickly dampened any attitude rates to set up for spacecraft separation just 15 seconds after engine cutoff. INSAT-3DR separation was confirmed and loud cheers emerged at Mission Control when the success of the GSLV F05 mission was announced- GSLV’s third in a row. For INSAT-3DR, the first steps in orbit were the deployment of its power-generating solar arrays and the acquisition of attitude control. The satellite will complete orbit-raising maneuvers in the coming days, relying on the Liquid Apogee Engine to reach its orbital perch 35,800 Kilometers over the equator.